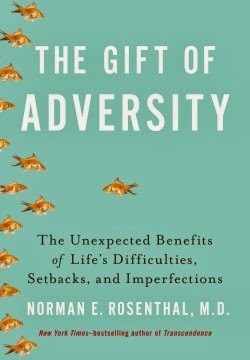 Adversity is often disguised as an excuse, but Norman E. Rosenthal, M.D. explains that really responding to adversity is a necessary learning experience. He quotes Aeschylus, "he who learns must suffer." A successful psychiatrist, Norman recounts his life and of others who learned by suffering some sort of adversity. He suffered being stabbed (also with consequences many years later), emigrating from South Africa to America, and the usual growing up problems. As a Jew he was conscious of the Holocaust and as a South African he was acutely aware of apartheid injustices. We learn through adversity. It is one thing to read about adversity, but in fact most of us learn how to deal with it as we encounter it. Still there are many ideas that can help understand and benefit from it. Dr Rosenthal sees as one anchor, friends that we need to treasure. One of his accomplishments came about from studying SAD, seasonal affective disorder which he and his wife experienced after moving from South Africa to Brooklyn, New York. He noticed other people had similar problems and researched and experimented to find better ways of coping with it. He pioneered light therapy. He encouraged the use transcendental meditation as a way of dealing with PSTD He has also written about jet lag. Rosenthal has rediscovered meditation and like Charles Duhigg feels it can be a keystone habit, that is one that helps over ride all other habits. Each reader brings their own history to the book. Most of us will find a few words that hit home--I did.